Project manager and editor Colin Miskelly concludes his two-part blog on personal highlights from the New Zealand Birds Online website project. To see the first part, visit New Zealand Birds Online – a few of my favourite things: Part 1. The concept was simple – a three-step photographic key, letting viewers put a name to a bird, and leading them to its page. But building the code to make it work required much technical wizardry by James Macfie of Samdog, and then long hours for me, populating 106 pages with over 1000 images. The end result was worth it, not only because it worked, but because each page became a celebration of the gorgeous images that populate the website. Note that the original plan was ‘three clicks and you are there’, but we had to change this to ‘3-times-select-then-click’ to prevent smartphone users making premature selections as they scrolled through the options. Bird-watchers love lists. 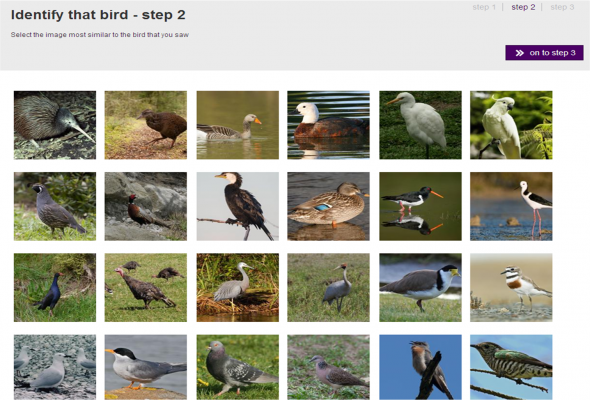 New Zealand Birds Online can be used to generate thousands of lists based on bird groups (e.g. raptors, or waterfowl) or localities. The lists may be as small as the two species of stilts, or as large as every bird species in New Zealand. Websites are ideal for creating customised lists, but it took much keyboard pounding by Tom Young of Samdog to create the template for the branded ticklists that can be folded in three and tucked in your notebook. Each locality list can be filtered to include only those birds you would see on a day trip (the default option), or just rarer species, or extinct species, or a full list…. and once you have your selection, you can sort them in taxonomic sequence (the default option) or alphabetically by common or scientific name. Then simply click the lower print icon to turn your selection into a hard-copy ticklist. Many websites provide links to existing published material, but do any others use book covers as recognisable portals to the information that they contain? We are not aware of anyone doing this before. 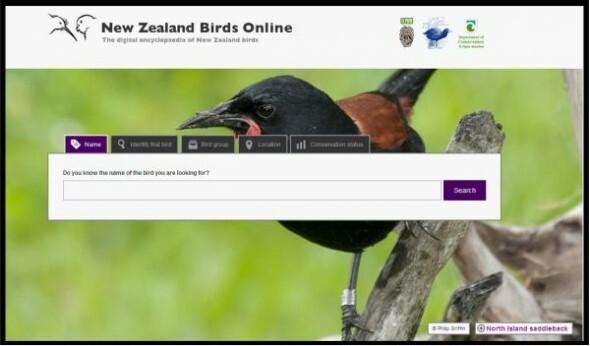 Many publishers and authors agreed to support New Zealand Birds Online through allowing their work to be reproduced. The book-cover icons are an elegant solution to providing a link while reinforcing where the information has come from. This also ensures that bird enthusiasts recognise the books next time they see them in a book store. We wanted a logo that contained New Zealand’s most distinctive and easily-recognised birds. A kiwi by itself was too clichéd, so we added kakapo to the recipe – and Emily Fletcher delivered a beauty. The original full-colour logo ended up being too complex for website pages that contained so many other images and graphical elements, so Emily pared it back to the essence-of-kiwi-and-kakapo image used on most pages. But we will continue to use the original logo to promote the website, including on our Facebook page. The unique-and-distinctive New Zealand bird theme continued with the palate of 25 images selected for the homepage. These represent the 18 living endemic genera of New Zealand birds (one image per genus), plus another 5 distinctive endemic seabird species, to redress the strong landbird bias (we have only two endemic seabird genera, represented by yellow-eyed penguin and spotted shag). And I snuck in a kakariki and takahe, as additional characteristic or iconic New Zealand birds. As project manager, I could guide accumulation of content and development of the functional connectivity to make the website work, but making a website look great is an art. The intrinsic beauty of birds (i.e. the donated photographs) provided a great platform, but Sophie Taylor of Samdog can take most of the credit for producing a website that I think looks gorgeous. 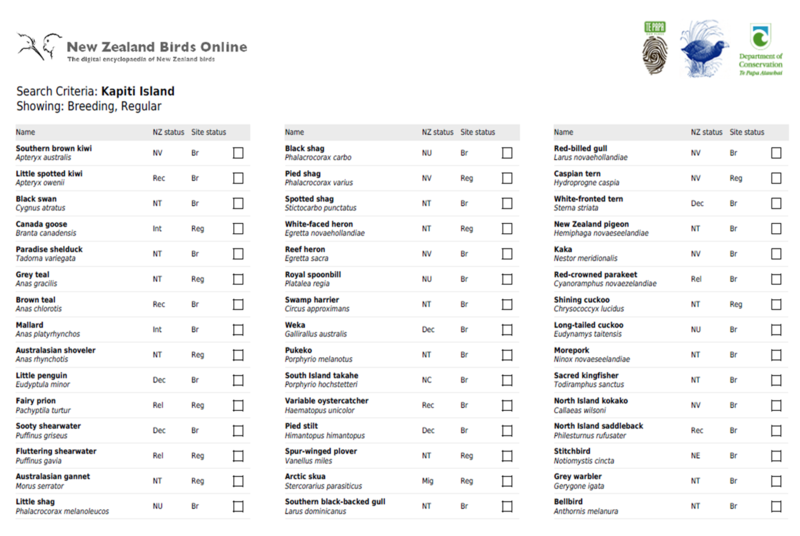 Perhaps the most satisfying aspect of the New Zealand Birds Online project for me is that the end product precisely matches the concept that I presented to Te Papa managers and OSNZ Council in June 2010. Back then we had no budget, and no guarantee that authors, photographers and sound recordists would be captured by the vision, and volunteer their time, knowledge and intellectual property. I am immensely humbled that so many people did. But there are two further ‘behind the scenes’ people who had crucial roles in this process. Florence Liger (Te Papa webteam) and Jane Nevin (Samdog) delved into the minutiae of the project to ensure that all the required detail was included in the scoping documents. This meant that the developers built precisely what was required (and what we could afford). Logging on to the developing site and seeing each layer unfurl was a huge thrill, and I hope that this magic has carried through to the published website. The New Zealand Birds Online website was a collaboration between Te Papa, the Ornithological Society of New Zealand, and the Department of Conservation, and received funding from the Terrestrial and Freshwater Biodiversity Information Fund (TFBIS). The underlying database was built by Signify, and the front end of the website was developed by Samdog. The project was generously supported by the following book publishers: Te Papa Press, Penguin Group, the Ornithological Society of New Zealand, Arun Books, and the Department of Conservation. Crazy about kākā? We have the website for you!